It's the final day of London Breakfast Meetings Week, so the C&IT team has sought out some of the best venues in the capital for early morning business events. If you’re keen to follow your breakfast meeting with a fun group incentive, London Zoo is a great choice. From boardroom meetings for ten to spreads for up to 260, the venue can provide a range of menu options, including fresh fruit and coffee. Delegates can follow up with a trip round the zoo or a teambuilding incentive, which include ‘I’m a delegate get me out of here’, an interactive treasure hunt, animal ice-sculpting and the ‘Haka’, an opportunity for guests to learn and experience the culture of a Maori tribe. This classic and centrally located all-day dining brasserie has a huge breakfast and brunch menu, which covers both the typical English breakfasts as well as American-style pancakes and waffles for those with a sweeter tooth. Its private dining room is situated on the first floor, above the main restaurant, and is accessible either through the main dining room or via a private entrance. The room has its own bar and lounge and seats up to 60 guests for breakfast. Hidden inside a series of old brick vaults near St Paul’s Cathedral is Cope de Cava. When it opened in May 2013 it became London’s first bar dedicated to the Spanish sparkling wine Cava. A venue specialising in Spanish sparkling wine may seem like a peculiar venue for a breakfast meeting, yet its gothic design and Catalan-inspired décor offers a fresh change to the traditional boardroom setting. A vast breakfast menu, high-quality teas, coffees and a range of juices are on offer for groups small and large (total capacity reaching 150 delegates) and at a minute's walk from Blackfriars station it is easily accessible during rush hour. 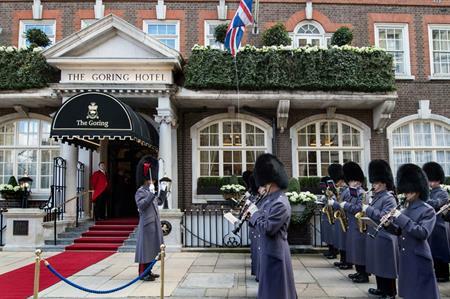 Following a designer renovation in January to mark the property's 105th anniversary, The Goring reopened one month later, although the classic venue is still as quintessentially British as ever. The venue's Breakfast Room can host boardroom set-ups for between six and 12 delegates on a vast antique table underneath an Edwardian chandelier. For a breakfast meeting far above the city with unparalleled views of the London skyline, head to Duck and Waffle. The restaurant is best known for its breakfast and brunch menus with dishes including ox cheek benedict and its namesake duck and waffle, which can be enjoyed with a fresh mimosa. The restaurant features the highest private dining room in the city, which can seat up to 18 guests. Duck and Waffle does not charge hire fees, instead charging on a food and beverage minimum spend or minimum number of guests.